Recipe by Ozlem Ennor. Photography and styling by Tanya Zouev. I have a wonderful friend named Ozi who is Turkish. We met at a local playcentre through our young sons, were bouncing all over one another on a jumping castle like young pups. Ozi rushed over to see if her rambunctious son was possibly (accidentally) hurting my equally rambunctious son. I assured her he wasn’t and from there we started to chat. Quickly the conversation turned to food and we found common ground: she had informed me she loved to cook and I told her I am crazy about Turkish food. With the boys thoroughly engrossed in each other’s company, a long conversation about Turkish cuisine ensued and the rest is history. You see, that’s one of things I love most about food. Once you find someone who loves it equally as you do, you instantly become kindred spirits. Ozi is a really good cook and in the time I’ve known her she has taught me a lot about her country’s cuisine. She introduced me to pomegranate molasses and kirmizi biber salçasi, which is paprika paste, both ingredients I’ve grown to love and use in my cooking. She also introduced me to fasulye (pronounced fah-sool-ya), a stew made from green beans and tomatoes. I had eaten versions of it here in Sydney at my favourite Turkish restaurant Erciyes in Surry Hills, in Greece and even in an Armenian restaurant in Moscow but never really thought of making it myself. I was lucky enough to have Ozi bring over to my house a container of fasulye and I was taken with how delicious it was. When I asked her what was in it and how to make it she informed me it was one of the easiest things to make with a really simple list of ingredients. I find it extraordinary how a dish so simple can be simply so good. In fact I didn’t believe it could be so good with so few ingredients so I tried meddling with it, adding spices: trying cumin, ground coriander even caraway seeds but frankly, it’s best left just as is. It goes to show that some recipes are best left to simple traditional methods and don’t need improving because they’re already fabulous just as they are. So here is fasulye, a simple vegetarian dish that takes very little time to prep, just chop up the ingredients and throw them in a pan. I have been making this regularly and enjoying it as a side and even on it’s own. It’s great hot and equally good cold on a summer’s day. Even though this is Ozi’s Turkish recipe, I’ve added an optional Eastern European touch by including fresh dill which makes it technically an Armenian version. Either way it doesn’t really matter, it tastes wonderful with or without it. Prep time: 15 mins, cooking time: 1 hour. Serves 4-6 as a side. 1. In a cold deep casserole pan such as a Le Creuset layer the onion first with the garlic, the beans and tomatoes on top. Pour the olive oil over the layered vegetables, add agave nectar or sugar and place the lid on the pan. Turn the heat on to medium and cook the vegetables for approximately fifteen minutes, do not stir, just give the pan a shake every couple of minutes to ensure the contents don’t stick to the bottom. 2. After the beans have started to lose their vivid green colour (approximately fifteen to twenty minutes) you can then stir all the vegetables to combine. At this point turn the heat down to low and put the lid on the pan leaving a crack for steam to escape and cook for a total of one hour, stirring every now and then. The beans will be soft and have a beautiful sweetness to them at the end of the cooking time and there will also be some soupy liquid in the bottom of the pan. How much liquid there is will depend on how fleshy or juicy the tomatoes were that were used to cook with. 3. If you wish add the fresh dill at the end and stir through otherwise just season to taste. 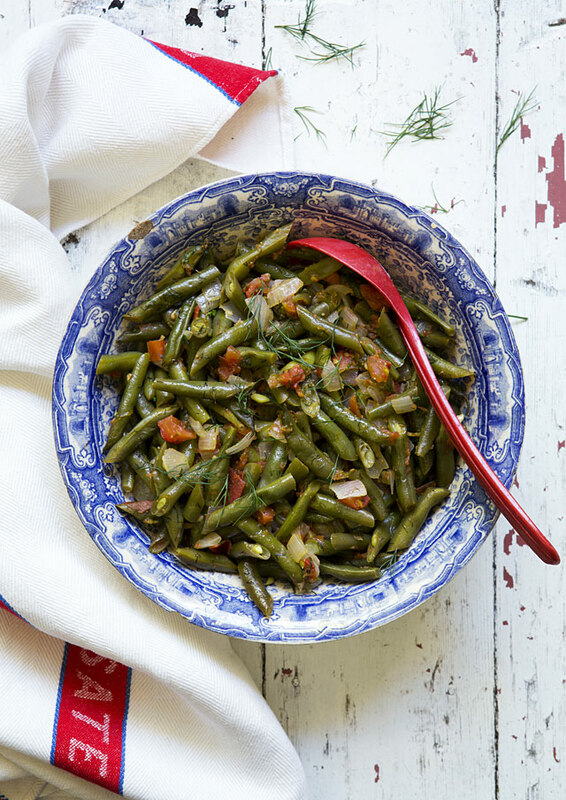 Footnote – a bit of food trivia for you, the Turkish word for green beans is fasulye, the Greek fasolakia and the Russian is fasol. I wanted this shot to appear as though someone’s Turkish grandmother had thrown the fasulye together so I went for a white-washed Mediterranean look. The large blue and white vintage bowl is an English piece and was found, chips and all at the local Goodwill. The vintage tea towel came from the Salvo’s as did the vintage Tilley Plastics bakelite spoon. The background is an old tabletop pulled off an old outdoor table a neighbour put out in a hard rubbish council clean-up which was painted white and then weathered. The only light used is window light.